Fishing Buddy is designed to provide distance measurements in real time from your current location and storage of hot spots using GPS. Markers can be placed at designated locations by clicking on the screen, dropping a marker at the current location, or entering coordinates. Can store comments with each marker and find markers by comment. The number of markers placed is limited by the storage capacity on the device. Quick zooming to current location for rapid viewing. Can be used to measure distances and mark hot spots from anywhere. Now with the NEW compass feature your phone can be pointed in the direction to move while tracking any marker! There are a number of ways the Fishing Buddy app can be used, however, to get started using the most common features follow these steps. Second, press and hold the "ME" button again to bring up the list of menu options. Then select "Save" and type in the name of the fishing trip (ie June 2, 2017, am, Lake Tahoo). 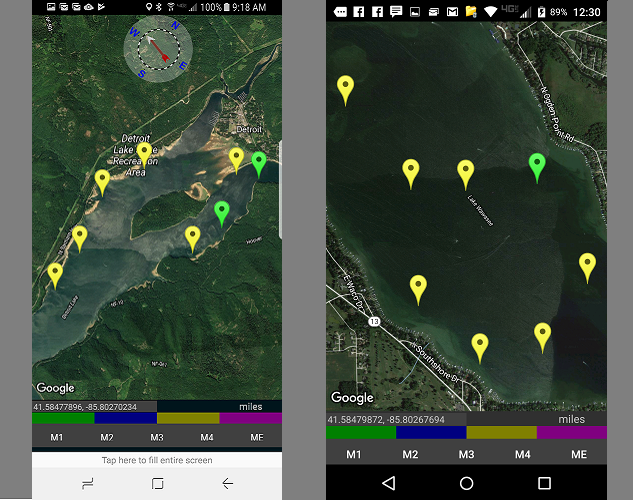 This will prepare the Fishing Buddy app to automatically save the markers whenever a marker is dropped at the designated location. Third, quickly press the ME button one time and a red marker will show on the screen marking your current location. You can always quickly get your current location by pressing the ME button one time. This will show the distances from the current location to the nearest 4 hotspot markers on the command strip at the bottom of the screen. Fourth, mark your home base by pressing and holding any of the colored marker buttons M1 - M4. This will drop one of the four colored markers at the current location and show the position on the screen. It may work best to predetermine which color you want to use to mark your vehicle, camping spot or home base and then always use that color to mark your return location then use different colors to mark your fish hotspots. Every time a hotspot marker is placed the marker will be automatically be saved. The markers can all be shown on the screen at any time by pressing and holding anywhere on the map where there are no markers. This will zoom in on all the markers. Fifth, tracking can be turned on by pressing and holding the ME button and select "Follow ME". The current location marker (red marker) will be constantly updated on the screen. The camera will follow the red marker whenever the device changes location but camera tracking can be toggled on/off by pressing the current location lat/long coordinates on the command panel. The coordinates will turn red if camera tracking is enabled. This option is turned on by default whenever "Follow ME" is turned on.